Many saxophone players are seekers – on a lifelong quest to find the optimum horn, mouthpiece, reed and set up to give them the ideal response, intonation and sound colour. It is well known that the neck has a big influence on these parameters. If one does not want to part with one’s favourite instrument, it is possible to improve the playing characteristics with different necks. 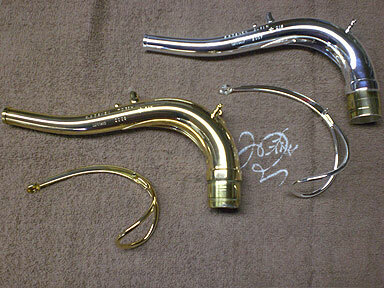 The first manufacturer who identified this market was the Japanese company Yanagisawa. 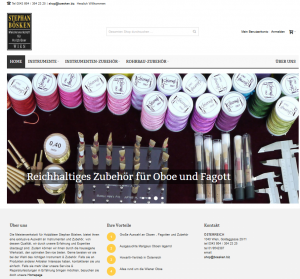 They have been offering different saxophone necks for more than 20 years. Nowadays, all important saxophone manufacturers offer alternative necks for their instruments. I started my training as an apprentice at Julius Keilwerth in Nauheim (saxophone manufacturer) and have been leading my own master workshop since 1998. During my employment with Wilhelm Heckel I learnt also about the importance of the bocal for the bassoon. This knowledge inspired me to design my own saxophone necks. I am grateful for my good contacts to professional saxophone players who tested my necks and whose feedback has been very valuable for me. Since 1993 I have been offering various series of hand-made necks for saxophones that have become very popular with professional saxophone players. 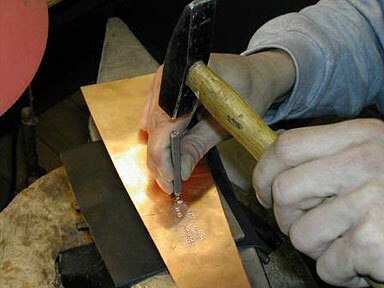 A piece of brass is cut, rounded and soldered together. Then it is drawn on a mould and gets its characteristic facing. 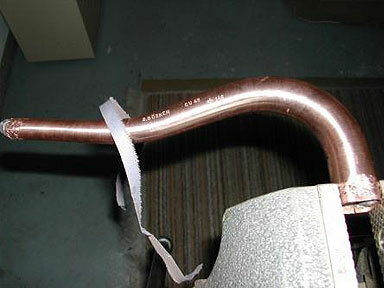 In the next step it is filled with lead and after having cooled down is bent into its specific shape. Afterwards it gets hammered, sanded and polished. Finally the lead is heated again and poured out. 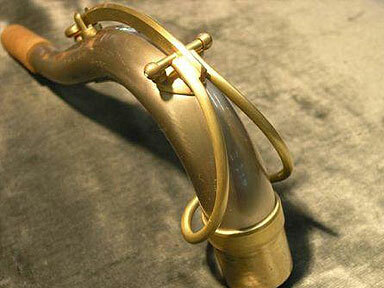 The usual process used by saxophone manufactures is to hydraulically blow up a seamless, cylindrical piece of brass. Using this technique the wall on the wide end is much thinner than the wall on the small end. I am using the labour-intensive, traditional method which professional saxophone players regard as superior. In order to satisfy the different expectations I use three different bores (No. 4, 5 and 6) and various metals: copper, brass, red brass, sterling silver and nickel-silver. Further alternatives are: thin walled or thick walled and various finishes: unlacquered, lacquered or silver-plated. 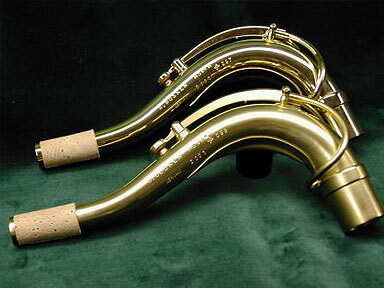 Finally there are 2 different bends to choose from: the normal bend (approximated to Selmer necks) and a more plane bend. Using a plane bend the chin can be held higher resulting in a wider opening of the throat. Knowing the variety of individual playing techniques and intonations, I offer different necks to achieve a lower or higher intonation in the high register. There are so many individual differences regarding embouchure, mouth pieces and reeds that it is recommendable to select the neck together with me. It makes it easier to find the ideal size, material, wall strength, length and intonation in the high register.